Richard McCarty shares the secrets that helped him catch three 13-pounders. Fish live in a semi-transparent world suspended between earth and sky. Some people cast lures aimlessly into this watery world, hoping luck will bring their hook and a fish together. and then there are those who hunt for big fish and haunt those waters where lunkers live. Richard McCarty is a big-fish hunter. No one has entered more 13-pound-plus largemouth bass into the Budweiser ShareLunker program than McCarty. And nowhere in Texas are more big bass caught than in Lake Fork. 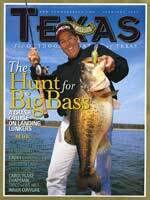 From March 2003 through May 2004, Lake Fork anglers reported catching 2,826 bass weighing 7 pounds or more. Of those, 414 tipped the scales at 10 pounds or better. But only 18 fish broke the 13-pound barrier that admits largemouths into the ShareLunker program. True trophy bass are really rare, and catching them requires either sheer dumb luck or a special person using the right techniques. We’re in a cove along the main lakeshore. Red-winged blackbirds call for a mate from atop cattails along the bank; just beyond, golf carts purr toward a green on the point of land protecting the cove from south winds. Black-bellied whistling ducks and scissor-tailed flycatchers decorate tree trunks jutting from the water. Far to the northwest, dark clouds ahead of a cold front emit occasional rumbles of thunder. We’re hoping lightning keeps its distance, but the clouds and wind-rippled water are welcome. Fish bite better under those conditions, McCarty says. McCarty switches to a green plastic lizard and begins fishing a spot the size of a bathtub. He bounces the lizard across the bottom by jiggling the rod tip, rapidly moving it up and down a couple of inches. Often fishing no more than 4 feet from the boat, he studies the water, trying to see the fish he knows is there. It’s a big female on her spawning bed, and she just won’t bite. McCarty makes a third cast, and suddenly lightning strikes — fish lightning. The lure disappears in a boil of water, and the rod instantly horseshoes. “It’s a big one,” McCarty says. Moments later the scale proves he knows his fish: It weighs in at a fraction more than 9 pounds. Most people would be thrilled to catch a 9-pound bass, but in McCarty’s world, it’s a dink. The Lake Fork fishing guide has entered three monster bass into the Budweiser ShareLunker program, and he wants very badly to be the first person to land four. In 17 years of guiding on Lake Fork, McCarty has hooked four fish he is sure weighed 13 pounds or more — an average of one every four years. Catching one is like getting a college degree in bass fishing. Catching three is like getting a doctorate. Four? I’m studying bass fishing under the president of Bass U. As if to prove his words, two 5-pound males take his lure off the same bed. The larger female follows the lure but won’t bite. McCarty kicks it up a notch and ties on his best big bass bait, a Zoom Super Salt Plus 8-inch magnum lizard in watermelon candy color. He keeps dropping the bait in front of her nose for half an hour before he gives up. “If I get one bite every hour doing this, I’m more than satisfied, because I know the fish will be a big one,” he explains. Thunder rolls across the lake, and we head for the ramp, but the storm skirts around us. McCarty grins at me through a light rain and says, “It’s your call. We can go in or keep fishing.” I choose the latter, but the rest of the day brings no more big fish. The day ends with one more lesson in bassology. McCarty takes us into a shallow cove with numerous cleared circles of gravel in 3 feet of water. Each is a bass spawning bed, and we are no longer fishing for bass, we’re stalking them. McCarty peers intently into the water as the trolling motor pulls us slowly among tree trunks. He pitches the lizard, reels it in, and says softly, “She’s caught and doesn’t even know it yet.” On the next cast the rod bows, and a 4-pound bass tailwalks to the boat. Only three people — McCarty, Jim Gore and Bill Lozano — have entered three 13-pound-plus fish in the ShareLunker program. And the race is still on to see who will catch number four. David Campbell, Budweiser Share-Lunker program coordinator wheels the aquatic equivalent of an emergency room crash cart up to the tailgate of a pickup truck carrying a 200-gallon insulated tank equipped with aerator and bottled oxygen. Inside this big bass ambulance swims a fish literally worth its 13 pounds in gold. Four hours earlier, the fish was an anonymous resident of Lake Fork, hanging out under the Texas 154 Bridge across the lake, eating crappie. Now it’s ShareLunker No. 1 of the 2004 season, caught by Frank Hardy of Mineola, a potato-chip route salesman fishing for crappie on his day off. The Lunker Bunker (more formally known as the Intensive Care Unit) contains 22 fiberglass tanks, each of which can house one female ShareLunker through the spawning season, when a pure Florida largemouth bass male is put into the tank with her. The resulting eggs — laid on square mats resembling outdoor carpeting — are hatched and the fry stocked back into Texas waters. The ultimate goal is to produce a new world record largemouth bass, but the most immediate effect is to improve the quality of fishing. Texas leads the nation in the number of bass weighing in the teens. The Edwin L. Cox, Jr., Texas Freshwater Fisheries Center was built around the ShareLunker program. The Athens community pledged $4.1 million to win the bidding for the site, and the balance of the $18 million cost came from federal Sportfish and Wildlife Restoration funds. No state money was used for construction. Budweiser has supported the ShareLunker program for more than 10 years by providing operating funds, prizes for anglers who enter fish into the program and the specially equipped truck used to pick up and return lunkers. Recently, Toyota became the title sponsor of the program. Many anglers elect to return their fish to the water after the spawning season. It’s the willingness of anglers to share their fish with the rest of Texas that impresses Campbell most. “The anglers have made this program,” Campbell says. “One of the biggest things I’ve learned from this program is that people who fish want to help Texas Parks and Wildlife Department. I regard them as the best conservationists in Texas. Information on the ShareLunker program, including how to enter a fish and data on all entries to date, can be found at http://www.tpwd.state.tx.us/spdest/visitorcenters/tffc/sharelunker/.